Whether it’s windstorms, snowstorms, heavy rains, or severe cold and ice, when Mother Nature makes her presence known, and she always does, it’s prudent to have your home and emergency supplies ready. By getting prepared for bad weather and power outages you can better ensure that you and your family will weather whatever Mother Nature throws your way. Start by taking the following actions before the next storm hits. Prepare your home for winter by protecting any exposed water pipes in any un-insulated spaces like in basements, crawl spaces, and attics. Keep them from freezing by wrapping them with insulated foam material. For outdoor water faucets you can purchase an inexpensive insulated Styrofoam cover to place over them. Cold drafts around windows and doors are the number one culprits that contribute to increased heating bills. Check around door jams for air leaks and install weather-stripping around the sides and top of doorframes as well as door sweeps for the bottom of doors to keep the frigid air out. Outside check gutters and downspouts for debris. It’s also a good idea to keep any storm drains clear of debris near your home to avoid flooding. 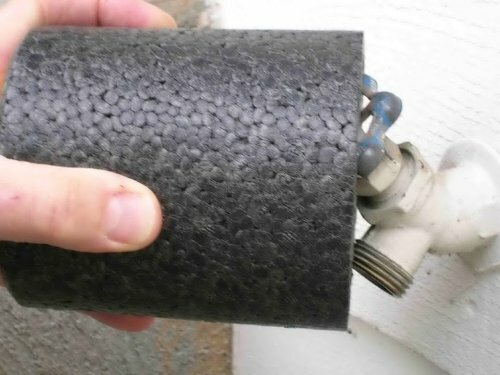 Foam insulation for water pipes. FaucetBeanie Outdoor Faucet Cover -- NO Hooks, NO Bands, NO Straps! FaucetBeanie uses no hooks no bands or straps. It's very easy to install. At home it’s a good idea to have extra blankets, a few flashlights, a battery-powered radio, extra batteries, sweaters, coats, gloves, hats and boots in a handy place in the home. Keep extra food and water, enough for three days minimum. Some food items such as canned food, chili, soups, tuna fish, and pastas are good options. Think of easy to prepare food. Don’t forget about your pets and have extra food for them too. It’s also a good idea to have plenty of propane for your outdoor grill. If you lose power and don’t have natural gas, having an outdoor grill gives you another option to cook food. If you have a working fireplace, having plenty of firewood to burn provides another source of heat in case your power goes out. Some of the same items you keep in your home you should keep in your car. I suggest having a blanket, emergency kit with flashlight, extra batteries, radio, first aid kit, warm gloves, hats and boots, protein bars, and some bottled water. A cell phone charger will come in use if you need to charge your battery. Make sure you keep your gas tank at least half filled at all times in case you get stuck in traffic due to snow. Check your tires for proper tread and make sure you have tire chains for driving in snow and ice road conditions. Lastly, create a family emergency plan so all members know what to do and where to go should winter weather keep you from being together. There are many other items you can check and add to this list. By preparing for cold weather and any possible emergencies you will ensure the safety and comfort for you and your family and maybe keep a few more dollars in your pocketbook as well! 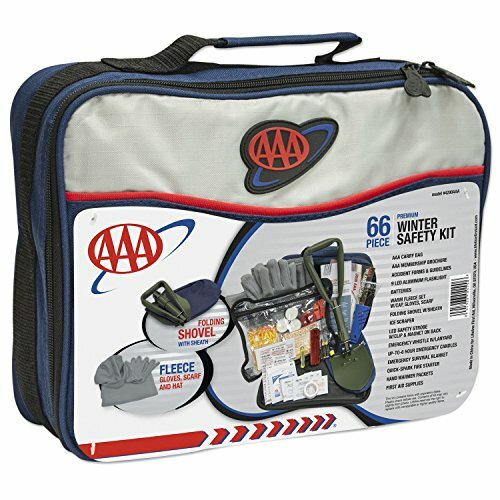 This kit has everything you would need in a winter emergency situation to keep in your vehicle.